You know those recipes that just instantly remind you of your childhood, family gatherings and summer BBQ’s? Well, this is one of those for me. I hadn’t eaten this in years and actually had never made it in my own kitchen, until a while ago, one of my girlfriends hosted a summer BBQ and served this salad. I went nuts for it and ate WAY more than my fair share. Since then, I have been making batches of this salad to keep in the fridge for weekday lunches as it is so satisfying and nice to have on hand for a quick and easy lunch. The only thing I wasn’t crazy about was the caloric value in the recipe, because lets face it…mayo, bacon, cheese…three delicious items, but when put together, not exactly the healthiest when consumed together in a “salad”. So, I wanted to revamp it a little. First things first, there was no way I was going to eliminate the bacon…well, because bacon is delicious. BUT, I could attack the mayo and omit the cheese. So, I tweaked the mayo by using 2/3 greek yogurt and keeping 1/3 the mayo. This still gave us the mayo “taste”, but allowed me to add a good source of protein in the form of greek yogurt, not to mention reducing the calories and fat. Omitting the cheese is a case-by-case decision – if you are serving this for company, I suggest including it, but if it is a weekday lunch salad, I don’t think the salad absolutely needs it to be delicious! 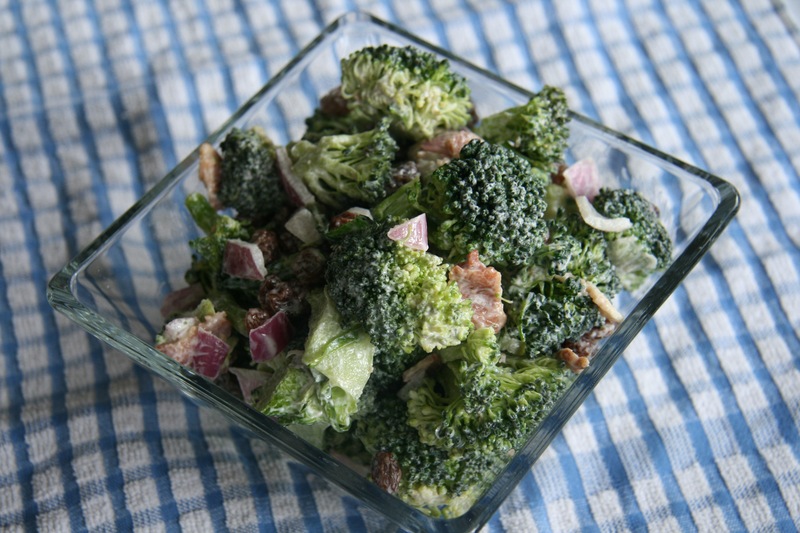 I can’t wait to whip-up another batch of this salad soon…and I know it won’t last long! Prepare bacon according to package directions or using your favourite method (I love baking my bacon in the oven, on a baking sheet. So easy to do and clean-up is a breeze!) Once bacon is cooked and cooled, crumble bacon into bite-sized pieces and set-aside. In a bowl, mix together the greek yogurt, mayo, sugar and vinegar and stir well. Wash and dry the broccoli florets. Cut into smaller bite-sized pieces. In a large bowl/container (with a lid is a great option, to make storage/clean-up easier!) 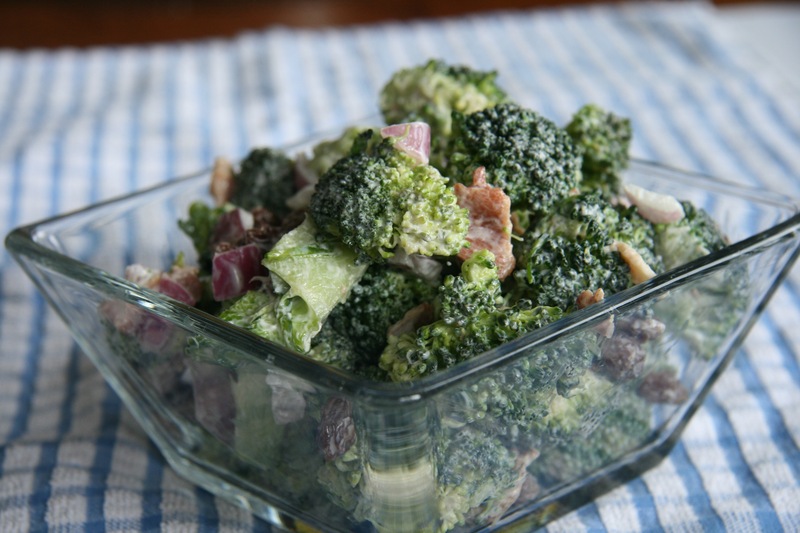 mix together the broccoli florets, the dressing, bacon, onion, raisins and cheddar cheese (if you are using it). Mix well. Place the salad in the fridge for a minimum of 1 hour, or longer, to allow the flavours to develop.